NewsGallery: CELEBRATE HALLOWEEN WITH MOMA'S PS1: MOVE! 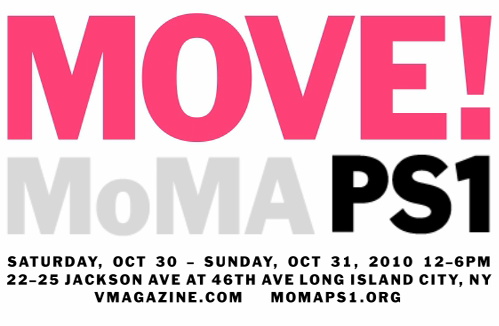 CELEBRATE HALLOWEEN WITH MOMA'S PS1: MOVE! MoMA's PS1 has collaborated with some fashion professionals: Cecelia Dean from V Magazine and style journalist David Colman to organize a two day event where art meets fashion to host the ultimate Halloween party: Move! The event will be held in LIC at MoMA's PS1 headquarters of course--offering a variety of performance arts: There will be fashion exhibitions mixed with visual and theater live installations. A total of 12 fashion designers and artists will be showing and performing. Have a look at the video below to see a sample of the sort of performance arts that awaits you at a PS1 Halloween MoMA style: starring Cynthia Rowley and Olaf Breuning (after the jump). OLAF BREUNING AND CYNTHIA ROWLEY FOR MOVE! AT MOMA PS1 from V Magazine on Vimeo.